Brewers have developed numerous techniques to prepare the popular beverage. All techniques are based on leaching via a solid-liquid extraction, and each method aims to produce the best quality coffee possible – a subjective feat that, despite evaluations from professional coffee tasters, is often a matter of personal preference. Because so many chemical compounds comprise a single batch of coffee, determining precise correlations between the solubles’ physical parameters and the beverage’s quality is difficult. However, understanding the mathematics of extraction can help identify the influence of various parameters on the final product. In a paper publishing next week in the SIAM Journal on Applied Mathematics, Kevin M. Moroney, William T. Lee, Stephen B.G. O’Brien, Freek Suijver, and Johan Marra present and analyze a new multiscale model of coffee extraction from a coffee bed. Now the authors take that model one step further. Because coffee brewing involves so many components, simplifying the model becomes necessary. The authors then utilize non-dimensionalism, which measures variables with respect to fundamental constants intrinsic to the problem, to further simplify the extraction model. This technique reduces the number of parameters–which include brew ratio, brewing time, water quality and temperature, grind size and distribution, and extraction uniformity–therefore letting the authors recognize the equations’ dominant terms before they begin actively seeking solutions. “Neglecting smaller terms thus allows us to find approximate solutions,” O’Brien said. Recognizing these approximate solutions helps the authors easily identify typical trends. Although the timescales of the aforementioned extraction methods are much shorter in fine coffee grinds rather than coarse grinds, the authors can still construct approximate solutions because of the timescale ratios’ small size. “The value of the solutions lies in the ability to explicitly relate the performance of a brewing system with the properties of the coffee, water and equipment used,” Moroney said. These solutions help predict the coffee quality for specific brewing configurations. 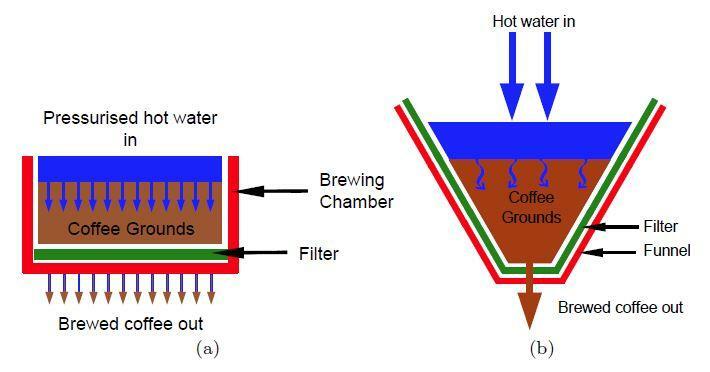 A possible next step involves incorporating the changing coffee bed shape that occurs while water flows through the conical filter holder of a drip filter machine. “This causes both the extraction and the flow rate through the coffee bed to become a function of position,” Marra said. The authors’ research also has the potential to inspire further models on different extraction processes, including unsaturated flow and the trapping of air pockets in a coffee bed, in the never-ending quest for a perfect cup of coffee.